What is a Nesting Box? woodpeckers, or mother nature to create these cavities for them. But human activities such as logging, agriculture, and development have left many species out in the cold. For instance, some of our most enchanting owls — including saw-whet, spotted, screech, barred, boreal, and northern pygmy owls, are having a hard time finding shelter in communities across the country. 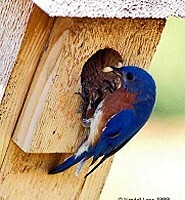 A nest box is a man-made nest for cavity-nesting bird species. There are more than two dozen cavity nesting species in the United States. Each nest box is created and placed specifically with the needs and comfort of a different species in mind. Why Should I Create a Nesting Box? There’s a serious shortage of accommodations in the bird world these days. It is getting harder for bird species that nest in natural cavities such as holes in decaying trees and stumps to find lodgings. Some species’ populations have declined seriously because of the dwindling number of natural cavities available to them. Nesting boxes are a real bonus for birds that raise their young in cavities. Many of these species settle comfortably into human-made dwellings. By creating and placing appropriate nesting boxes we can make a difference in the local population of bird species. An example of a comeback is the eastern bluebird, a species that was in serious decline due to the dwindling number of natural cavities available to them. The species has since rebounded because of nesting box programs organized throughout their range. Creating a nest box is not very expensive, however the costs can add up if you are trying to create many of them! Your goals for creating nest boxes will in part determine the costs of their creation. You may be building nest boxes just for the members of your organization, or for a local park, or you may be targeting a particular species whose population has dropped precipitously, or you may be reaching out to a specific audience such as schools in your watershed. Whatever the case, you will want to write out your specific goals and let them guide your work plan. The cost of creating a nest boxes is quite low. In fact the cost of the tools needed to create a nest box is greater than the cost of a nest box itself. If you are building one bird box, a hand saw, around twenty screws or nails (or wood glue), about ten square feet of 1” thick lumber and a drill with an appropriate sized hole-coring bit will be necessary. If you are building several nest boxes, you will probably want to use a circular saw instead of a hand saw. The cost of materials for a bird box can vary between under a dollar (scrap lumber and a few screws or nails) to a few dollars (new lumber). The cost of tools could be upwards of $250.00 depending on the tools you decide to purchase. There are many ways to finance a bird box project. The simplest method of cost cutting is to cut material costs by using leftover lumber. You can also partner with a lumber yard to get new or scrap lumber donated. As previously noted, tools are the primary cost of building nest boxes. You can cut these costs by asking members of your organization or friends to lend you their tools for the project. You can also ask your local high school wood shop class if they would be willing to donate their time to help cut lumber to prepare the bird boxes. If you are in need of funding for your project, you can also ask the recipients of the nest boxes to make a donation or you can seek out grants. The Home Depot and Walmart offer grants for community environmental projects such as these. You might also try the Chesapeake Bay Trust (MD) and the Chesapeake Bay Restoration Fund (VA) or other environmental grant making organizations in your jurisdiction. Creating and distributing a press release to your local paper, radio stations and/or television stations (see the Resources section for information on how to write and distribute a press release). It is not enough to have the construction materials for your nest boxes ready for your event—some final preparations need to be made to make your construction/distribution day a success. There are several steps to constructing a nest box from scratch. Ideally, the first three steps below would be completed before the volunteers assemble the nest boxes in order to save time and to minimize the number of people using potentially dangerous tools. Of all the available building materials, wood is about as good as you can get. It’s durable, has good insulating qualities, and it breathes. Three-quarter to one-inch-thick bald-cypress and red cedar are recommended. You can use any wood that resists weathering. Pine and exterior grade plywood will do, but they’re not as durable. Softwoods, particularly pines, are easy to work with. Avoid hard-woods, poplar, and basswood as they weather poorly. It makes no difference whether the wood is slab, rough-cut or finished, as long as the inside has not been treated with stains or preservatives. Fumes from the chemicals could harm the birds. There’s no need to paint cypress and cedar, but pine and plywood houses will last longer with a coat of water based exterior latex paint. White is the color for purple martin houses. Tan, gray, or dull green works best for the other cavity nesting species. The dull, light colors reflect heat and are less conspicuous to predators. Don’t paint the inside of the box or the entrance hole. Regardless of which wood you select, gluing all the joints before you screw them together will extend the life of your bird house. Galvanized or brass hinges and screws resist rusting and hold boxes together more tightly as they age. How elaborate you make your bird house depends on your personal sense of aesthetics. For the most part, all the birds care about is their safety and the right dimensions: box height, depth and floor, diameter of entrance hole, and height of hole above the box floor. Refer to the following chart, keeping in mind that birds make their own choices, without regard for charts. So don’t be surprised when you find tenants you never expected in a house you intended for someone else. Here is an example of an Eastern Bluebird box design (as seen on this page). Step 1 – Mark and Cut the nest box floor and sides. Mark four or five spots on the base of the nest box to drill drain holes. If you are doing four holes, place them about an inch from each corner. If you add a fifth hole, place it in the center of the base. Using a quarter inch drill bit, drill holes in the locations that you marked. Do not paint or stain the inside of your box! The installation process is just as important as the construction process. A nest box can be solidly constructed, but it will not attract the bird species that you desire if it is not properly located and installed. In fact, an improperly placed box may attract undesirable species and may actually help drive away the birds you are trying to attract. Where you put your bird house is as important as its design and construction. Cavity nesting birds are very particular about where they live. No matter how perfect your nest box, if you don’t have the right habitat, the bird s aren’t likely to find it. Not everyone has the habitat for a wood duck, purple martin, or screech owl. On the other hand, just about anyone can attract a robin, titmouse, wren, or chickadee. Let’s assume you’ve built or bought the “perfect” house. You put it out in your backyard in February. Months pass, and not one bird has landed on it. What’s wrong? It may be that you don’t have the right habitat, or it may be where you put the house. There’s lots you can do to modify your land to attract the birds you want to see. It can be as simple as putting out a bird bath or as complicated as planting fruit-bearing shrubs or installing a pond with a waterfall. But it’s much easier just to identify the birds most likely to take to your backyard as it is and put the appropriate nest box in the right place. Should you hang it from a tree limb, nail it to a fence, or mount it on a pole or a tree trunk? There’s a wide range between how high and low you can place a nest box. Pick a height that’s convenient for you. After all, you’ll want to watch what goes on and keep the box clean. If you want to watch chickadees from your second floor window or deck, fifteen feet is not unreasonable but it’s a lot easier to clean out a box at eye level. Don’t put bird houses near bird feeders. Don’t put more than one box in a tree, unless the tree is extremely large or the boxes are for different species. Cover the entrance until it’s nesting time for the birds you hope to attract. Starlings and sparrows nest early and frequently take over boxes intended for other birds. They are also partly responsible for the decline of many cavity-nesting birds. Don’t put nesting materials inside the box — birds would much rather find their own. But you can help out by making materials available outside. The box will more likely be used if it’s placed on a pole, mounted on a tree-trunk, or suspended from a branch with a hook screwed into the roof. Pick a spot that’s sunny at least part of the day. Turn the entrance away from the usual direction of wind and rain — birds don’t want a storm in their living-room! rid of parasites that can actually weaken and kill nestlings. It’s a good idea to wear a face mask (available at hardware stores) to avoid breathing fungi and parasites. Scrub your box with a stiff brush and pour boiling water through it for disinfecting purposes. For species like bluebirds, which sometimes nest twice in a summer, remember to houseclean between broods. Removing the first nest keeps adults from building another one on top of it. Otherwise, the new nest could be raised dangerously close to the entrance hole, making chicks easier prey for starlings or raccoons. If the roof is loose, the bottom warped, or a side cracked, take it down for repairs. If your box is not attracting birds (or it is attracting the wrong birds) you should consider relocating your box. Check to make sure that the box is still securely mounted. A poorly mounted box could fall with birds inside injuring them! Drill a few small holes on the sides of the box, just below the roof overhang to allow air and a little light to filter in. A few holes drilled in the floor near the walls will let moisture drain out. Nest boxes should be easily accessible so you can see how your birds are doing and, when the time comes, clean out the house. Part of being a responsible nest box landlord is your willingness to watch out for your tenants. Monitor your nest box every week and evict unwanted creatures: house sparrows, starlings, rodents, snakes, and insects. Be careful when you inspect your bird boxes. You may find something other than a bird inside. Don’t be surprised to see squirrels, a mouse, a snake, or insects. Look for fleas, flies, mites, larvae, and lice in the bottom of the box. Watch the nest for awhile. If you don’t see or hear any birds, go over and tap on the box. If you hear bird sounds, open the top and take a quick peek inside. If everything’s okay, close the box. If you see problems (parasites or predators), remove them and close the box. Here’s where a bird house with easy access makes the job simple. Most bird houses can be opened from the top, the side, the front, or the bottom. Boxes that open from the top and the front provide the easiest access. Opening the box from the top is less likely to disturb nesting birds. It’s impossible to open a box from the bottom without the nest falling out. While side- and front-opening boxes are convenient for cleaning and monitoring, they have one drawback: the nestlings may jump out. If this happens, don’t panic. Just pick them up and put them back in the nest. Don’t worry that the adults will reject the nestlings if you handle them. That’s a myth. Most birds have a terrible sense of smell. Cats—Nesting birds are very vulnerable to cats, as are fledglings and birds roosting for the night. Bell collars on cats offer birds little protection. Nailing a sheet metal guard or cone to a tree trunk is unsightly, but it may deter less agile felines. Houses mounted on metal poles are the most difficult for predators to reach, especially if you smear the poles with a petroleum jelly and hot pepper mixture. Squirrels—Red squirrels, and sometimes gray squirrels, can become a serious menace to bird houses and the birds themselves. If you find your nest hole enlarged, chances are a red squirrel is the culprit. Once inside the box, squirrels make a meal of the eggs and young. Adding a predator guard of sheet metal to the entrance hole is usually enough to keep squirrels out. Raccoons and Opossums—They will stick their arms inside nest boxes and try to pull out the adult, young, and eggs. Adding a predator guard to the bird house or to its pole support is a simple solution. Snakes—Snakes are an important part of the natural balance between predator and prey. If you find one of these reptiles in your bird house, please don’t kill it. Snake-proof your house by putting it on a metal pole lathered with petroleum jelly and/or hot red cayenne pepper. House Sparrows and Starlings—If you don’t discourage them, these two pest species, introduced from Europe, will bully or kill cavity-nesting birds. Since house sparrows and starlings are not protected by law, you may destroy their nests. But, remember, other birds are protected by law. Insects—Many insects lay their eggs and pupate in bird houses. You should inspect your bird houses for signs of gypsy moths, blow flies, wasps, ants, gnats, and bees. You can keep bees and wasps from attaching their nests by coating the inside of the roof with bar soap. In areas where gypsy moths abound, avoid placing boxes in oak trees, which are favored by the gypsy moths.